The presentation contains 60 color graphic slides. 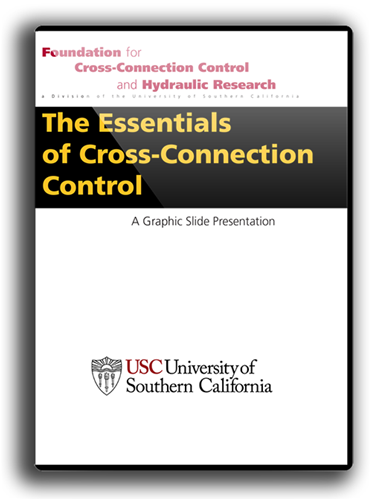 The slides were created specifically to enhance the explanation and presentation of cross-connection control essentials and each slide features 3-D graphics for a more detailed and professional look. The slides cover some basic hydraulics and definitions of the various terms such as backflow, backpressure, backsiphonage, cross-connection, etc. Graphics of each of the acceptable means of backflow prevention (the air-gap, the reduced pressure principle backflow assembly, the double check valve assembly, the pressure vacuum breaker assembly, and the atmospheric vacuum breaker assembly) are shown rendered in 3-D for greater detail. The proper applications of each of the backflow preventers are shown as related to the hydraulic condition of the installation and the degree of hazard.